If we, for example, happen to have 3 outs, then we have around 3*2=6% odds on each street (so, on the flop these odds are 3*2*2=12%). 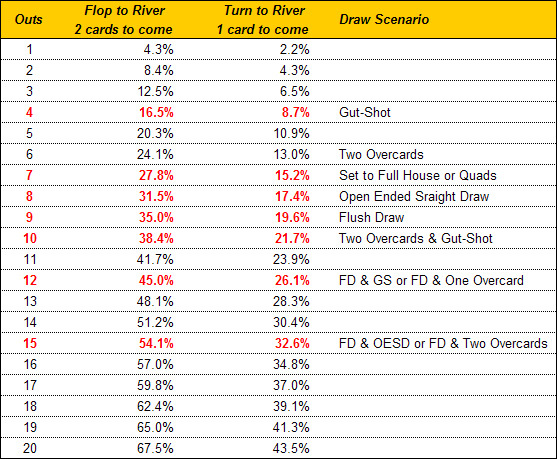 It can be clearly seen from these figures, that the true percentage is 12.5% on the flop and 6.5% on the river. But if we have 10 outs, then we have around 10*2=20% odds on each street. (so, on the flop these odds are 10*2*2=40%) It can be clearly seen, that the true percentage is 38.4% on the flop and 21.7% after the turn. Good luck, and let the rule of thumb guide you!